Luton captain Scott Cuthbert believe he is approaching something near his best form under boss Nathan Jones. The centre half was awarded a new one year’s extension to his contract last week after making 50 league starts for the club, taking his deal to the end of the 2017-18 campaign. A new manager comes in and brings a new lease of life to you, a bit of confidence and gives you that bit of belief. Cuthbert admitted he had found it tough going at times last season, but the appointment of Jones has seen him achieve the standard he knew he was capable of. The defender said: “I started okay, but had a little bit of a tricky spell towards the end of John Still’s reign. “It was a bit of lack of form, bit of confidence loss and since the manager’s come in, I feel like I’ve done really well, especially this season. On how the change has come about, Cuthbert continued: “It was just a case of a fresh start, nothing against the old regime, nothing to do with that. “A new manager comes in and brings a new lease of life to you, a bit of confidence and gives you that bit of belief. “He’s certainly done that with me and I’m working hard with Harty (Paul Hart) and Joaquin (Gomez) as well, Jared (Roberts-Smith), the fitness coach too. Cuthbert also believes that the Luton supporters are seeing just why he was brought in last summer, saying: “I think so, they’ll judge that for themselves though. 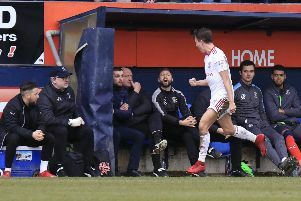 Town’s chief Jones believes that the 29-year-old, who has been at Leyton Orient, Swindon, St Mirren, Livingston and Celtic prior joining the Hatters, has made making steady improvements since he took over. He added: “I think he has. He was always a good defender, aggressive and committed, but we’ve tried to add a little bit of control to him and then asked him to do stuff that maybe others haven’t. “So we hope he’s going to add things to his game constantly, because that’s what we like to do and you’re never too old to learn.